Offices Held: Army Lieutenant, 1987-1991. For elective office, it's harder to say, since the elections are rigged. The tallies are openly falsified. Thirteen current Durham officials even claim to have won UNANIMOUSLY. This fraudulent situation comes from an illegal ban on write-in voting, passed by the G.A. in 1987. Interests and Hobbies: Music performance (voice, violin), Opera Co. of NC and Durham Savoyards. Bill of Rights Defense Committee. 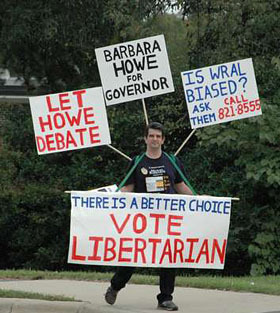 Libertarian Party. Constitution Gang. You may know me as a guy you see bicycling around town, especially to and from work along Markham Ave. and Hillsborough Rd.